1. GM in the spotlight: General Motors (GM) is set to release the findings of its internal investigation into its ignition switch defect and massive recall at 9 a.m. ET. GM has issued recalls for 2.6 million cars over a technical problem linked to the deaths of at least 13 people. In total, GM has recalled 15.8 million vehicles worldwide this year. More than a dozen executives have left the automaker as a result of the probe, a company source told CNN. 2. Rate cuts from the European Central Bank: The ECB cut interest rates, as expected, to a record low and set a negative deposit rate in an effort to help the European recovery. In a news conference 8:30 a.m. ET, ECB President Mario Draghi may announce other stimulus measures, and explain the rationale behind the moves. The Bank of England will also announce its latest monetary policy decision, but experts are not expecting any change. European markets shook off their earlier malaise and moved higher following the ECB decision. 3. Potential market movers -- Verizon, Sprint, T-Mobile, BNP Paribas, Asos: Shares in Verizon (VZ) are under pressure after reports that two of its competitors -- Sprint (S) and T-Mobile (TMUS) -- are close to combining forces. Shares in BNP Paribas (BNPQY) were weaker. France's biggest bank could be hit with a $10 billion fine for busting U.S. sanctions on Iran and other countries, according to reports. Standard and Poor's said Wednesday it could cut the bank's credit rating once the size of the fine and other potential penalties are known. French President Francois Hollande is expected to raise the issue with President Obama in Paris Thursday. Shares in Asos were down by about 31% in London after the retailer revealed it was being hit by a number of factors, including a strengthening pound. Overall, U.S. stock futures were slightly higher. 4. Earnings and economic data: The U.S. government will publish its latest weekly jobless claims report at 8:30 a.m.
J.M. Smucker (SJM)will report quarterly earnings before the opening bell. The company said Wednesday that it's going to raise the price of its coffee products by 9%. The latest German factory data for April showed a stronger-than-expected expansion in the sector. 5. International overview and Wednesday recap: Asian markets ended with mixed results Thursday. U.S. stocks closed higher Wednesday. 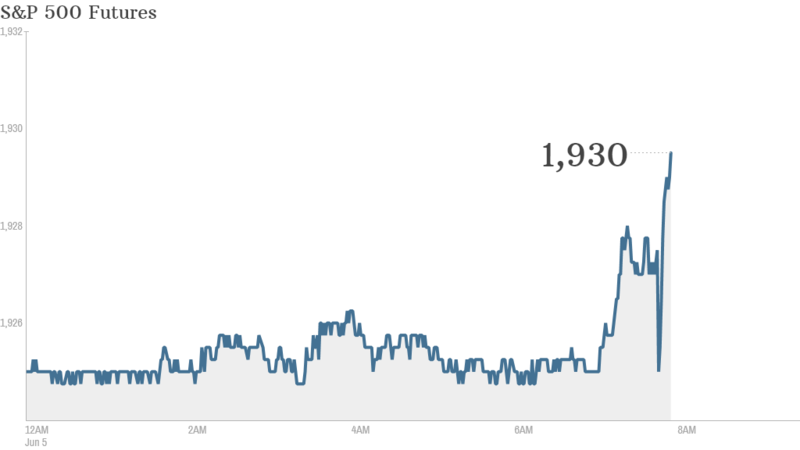 The S&P 500 rose a mere 0.2%, but still managed to close at a record high for the sixteenth time this year. The Dow Jones industrial average and the Nasdaq also made modest gains, with the Dow managing its second highest close in history.